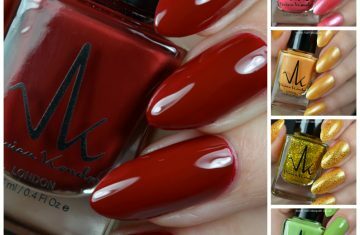 A quick post to show you few swatches from Sally Hansen and a sneak peak of polishes you are going to see over the next few days. Sally Hansen Complete Salon Manicure– Yellow Kitty. It is a pretty sheer polish, I am wearing 3 thin coats on this photo. The next swatch is from the same Sally Hansen range and is called Loves Me Not, it’s a beautiful dark purple duo-chrome polish with a lovely purple-orange shimmer. This polish was a pleasure to apply and very opaque, in this swatch I am wearing just 1 coat, pretty amazing right!? Sally Hansen Complete Salon Manicure- Loves Me Not. Both of the polishes were a pleasure to apply as Complete Salon Manicure has my favorite brush ever. If you get lucky you can find them in your local Poundland for £1, or if not so lucky, in your local Boots for £6.99. Barry M- Sequin Nail Effects. Barry M- Confetti Nail Effects. Barry M- Gelly Nail Effects. Really excited to show you all these amazing Barry M polishes, especially the Gelly ones as they are just BEAUTIFUL! Thanks for reading, Born Pretty Store review coming up next. November 7, 2014 By A.J. September 10, 2013 By A.J.